What is the DWC® credential? DWC (diabetic wound certified) is a specialized board certification in diabetic wound management. It demonstrates a candidate’s proficiency and mastery of essential knowledge and skills of wound management for the diabetic patients. Diabetic wound management focuses on overall diabetic wound care and promotion of an optimal wound healing environment, including prevention, therapeutic interventions, and rehabilitative interventions. How does it differ from a wound care certification? The DWC credential is a specialty certification that will focus on wound care as it relates to the disease of diabetes. Why is the certification necessary? In America today, our aging population is growing to record numbers and the incidence of diabetes is on a steep rise. This means the need for more dedicated wound care clinicians has never been greater. DWC certification ensures the industry, patient, and peers that the certificant has the skills and tested competency to treat diabetic wounds. What are the eligibility requirements for DWC board certification? 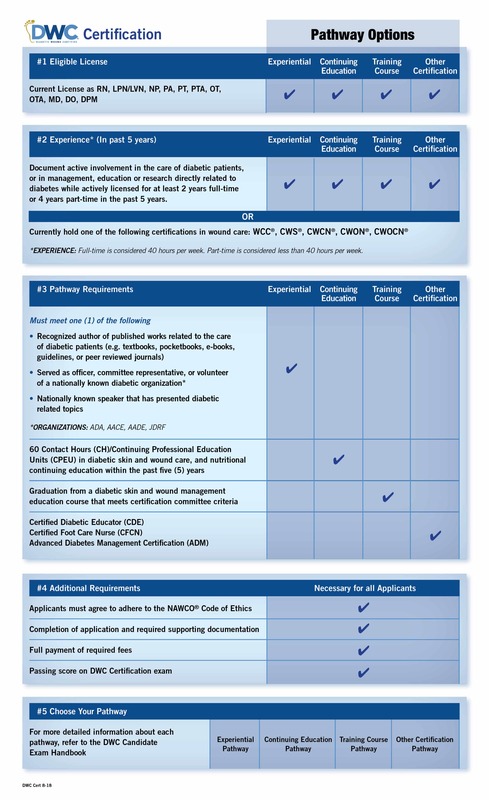 The chart below illustrates the required pathway options necessary to pursue certification. * ADDITIONAL COURSE FEE APPLIES FOR EDUCATIONAL PROVIDER. How is the DWC credential recognized? DWC is the only wound care certification in the specialty of diabetic wounds. It sets the highest threshold of certification making it recognized and relevant within health care. DWC certification is a clear, strong indicator of a candidate’s tested competency. At a PSI® Test Center may I skip questions and go back to answer those questions later? Yes, as long as you have time remaining and do not close out of the exam.